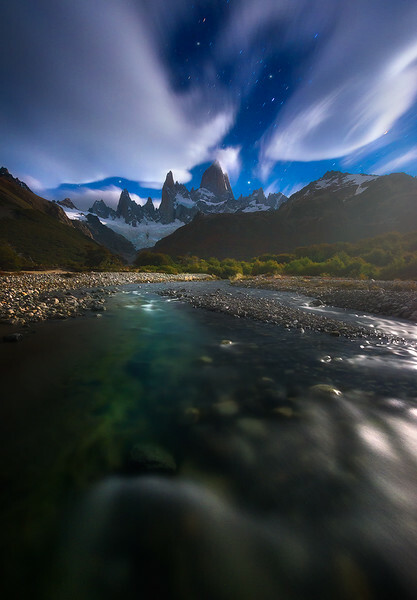 The 96% Moon lights the entire landscape just downstream from the looming Fitz Roy Massif. During a trip here in March of 2015 I was able to capture this scene while standing knee deep in the freezing cold waters of this stream which are fed by glaciers less than 2 miles West of where I stood. Just hours before one of the best sunsets I've ever seen covered this landscape with a pink and orange glow. The sky, filled with lenticular clouds, was so saturated during sunset that it's nearly impossible to edit the photos... I'm working on it tho! Look closely at this scene and you'll notice the lenticular clouds moving slowly through the sky over a long exposure time of 30 seconds. Small star trails also can be seen streaking behind the clouds. After shooting this location for an hour or so we headed back to our tents which were right down the river in secluded grove of trees which provided a little bit of wind protection. During the night the wind was so strong that my one man tent nearly folded flat on the group with me inside. Good times!